Dragon Gate USA is pleased to release “Best Of Wrestle JAM Vol. 1” on PPV with newly edited matches and English commentary from Mike Quackenbush and Leonard F. Chikarason. 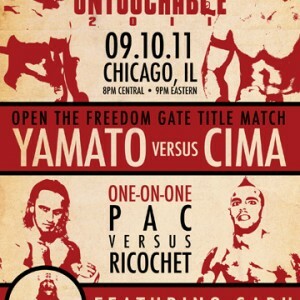 You get 2-for-1 on this PPV with 10 complete matches from a pair of nights on Dragon Gate’s “Wrestle JAM” tour. This means all your Dragon Gate favorites and other top talent like Matt “Evan Bourne” Sydal, Jack Evans, Roderick Strong, Austin Aries and everyone else has two big matches on this PPV. If you love action, excitement and cutting edge wrestling this PPV is a bargain.